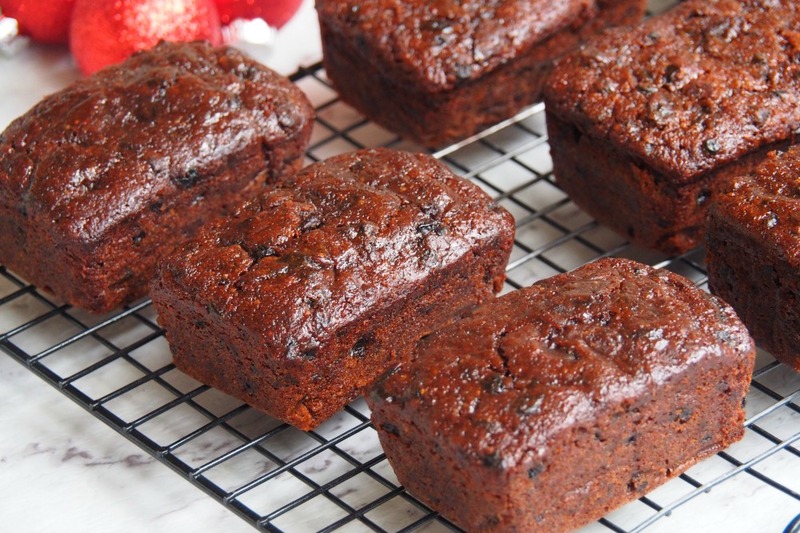 I think the saying “all good things come in small packages” was made with these Chocolate Fruit Loaves in mind. They’re small in size but mighty in yum! After I made my own mince pies, I became quite obsessed with all things dried fruit. I had never really cared for Christmas cake, I think it was the mixed peel that put me off. Talking of being put off, don’t let the fact that this cake has prunes as a primary ingredient put you off. The prunes are the secret hero of these little loaves making them marvellously moist and moreish! When I was a kid, I used to hate Christmas cake. However, I’m pleased to report that these lovely little loaves are the opposite of the Christmas cakes of my youth, which were dry and crumbly and full of mixed peel. These little beauties are rich, bouncy and full of all my favourite dried fruit and there’s not a piece of mixed peel in sight! 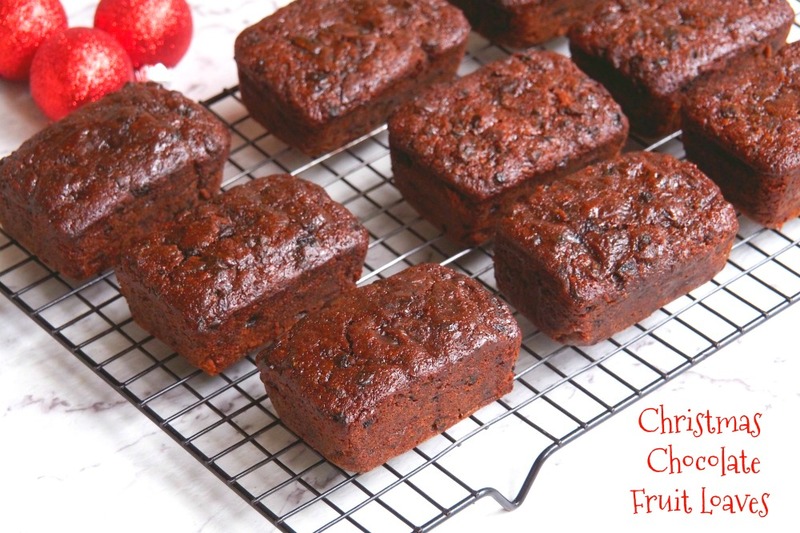 I’ve left the ingredients “dried fruit” deliberately vague because really you can use whatever you have to hand or whatever tickles your fancy – dates, cranberries, raisins, sultanas, cherries, figs – you name it you can use it. This was a Nigella recipe that I first adapted to the Thermomix and then adapted to my mini loaf tin because… Christmas cuteness! If like me, you only have one mini loaf tin, you’ll have to make one big mixture and cook it in two batches, but if you’ve got two tins, you can pop them both in the oven at the same time. Whichever way you use your loaf (tins,) just remember to fill the empty holes with cold water to ensure even cooking for each and every loaf. I never thought I was organised enough to make a Christmas cake because of all the soaking and prep work that most recipes call for in advance. But this recipe is a doddle, you just melt and mix, and bake and go! It’s easy peasy, orange squeezy! Little effort, big taste! 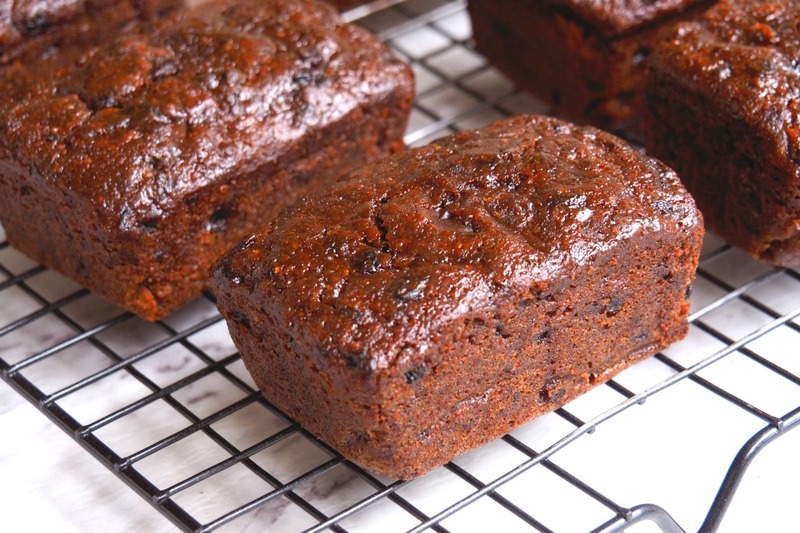 Have you ever made a Christmas cake? Is there a food you hated as kid, but love as an adult? Roughly chop the prunes and place in a large, wide saucepan alonng with the dried fruit, butter, sugar, honey, Kahlua, orange juice,zest, mixed spice and cocoa. Bring the mixture gently to the boil, stirring as the butter melts. Simmer the mixture for 10 minutes, then remove from the heat and allow to cool for at least 30 minutes. Preheat the oven to 150C/130C fan-forced. Line 8 holes of a mini loaf tin with a double layer of baking paper. Add the flour, baking powder and bicarb and the beaten eggs to the dried fruit mixture and stir with a wooden spoon or spatula to combine. Fill the holes of the loaf tin, place in the oven and bake for about 40 minutes. The loaves should be firm to the touch but still look a bit shiny and sticky. If you insert a cake tester into the centre of the loaf, it might be a tad sticky, but it’s all good. Allow the loaves to cool in the tin and once cool, tuck in immediately if you so desire. 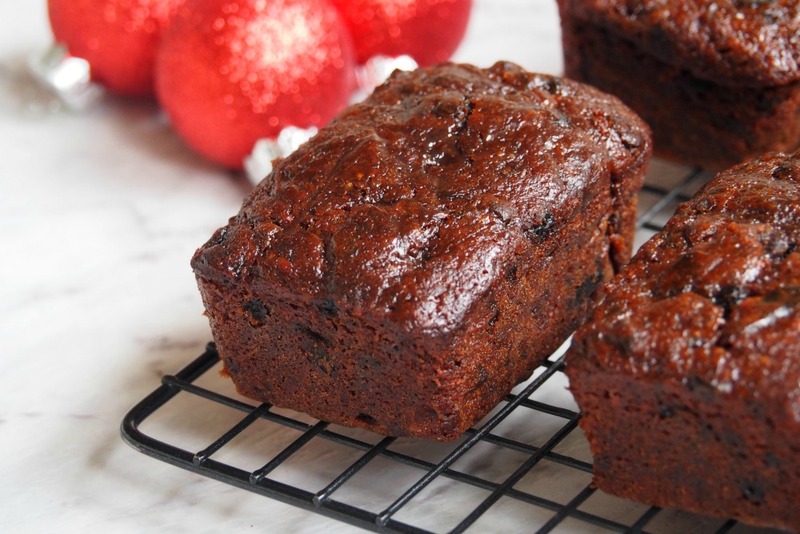 Like any fruit cake, these beauties have a long life, wrap them in baking paper and a layer of foil and store in an airtight container for up to 2 weeks. Chop the prunes for 3 seconds on speed 5. Add the dried fruit, butter, sugar, honey, orange juice and zest, mixed spice and cocoa to the the TM bowl. Cook for 13 minutes at 100C on reverse speed 1. If the blades struggle to start mixing at the start, set the speed on reverse speed 2 for a minute and then revert to reverse speed 1 for the remaining time. Add the Kahlua and mix for 30 seconds on reverse speed 3. Transfer the mixture to a large mixing bowl and allow to cool for at least 30 minutes. If milling the almonds to almond meal in the Thermomix, add almonds to TM bowl and mill for 10 seconds on speed 8. Add the flour, baking powder and bicarb to the TM bowl and mix the dry ingredients for 5 seconds on speed 6. Add the dry ingredients and the beaten eggs to the dried fruit mixture and stir with a wooden spoon or spatula to combine. Allow the loaves to cool in the tin and once cool, tuck in immediately if you so desire. 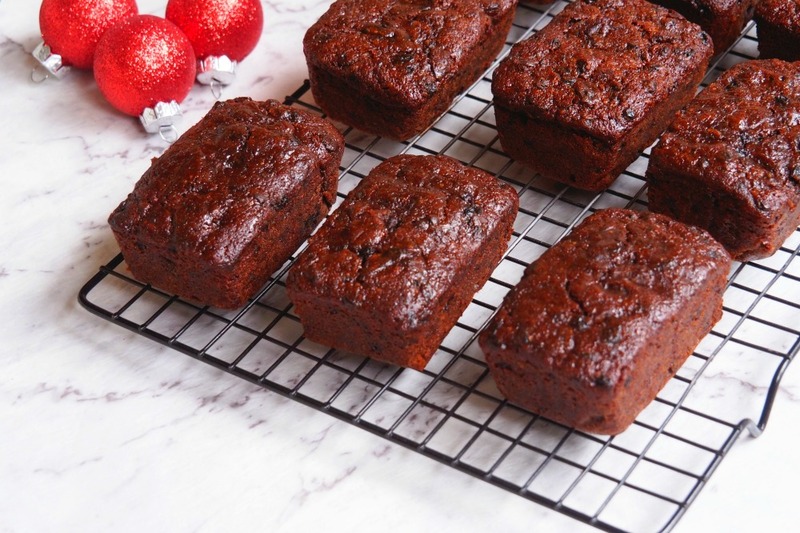 Like any fruit cake, these beauties have a long life, wrap them in baking paper and a layer fo foil and store in an airtight container for up to 2 weeks.